What Makes Our Lodges Different? Spring is the perfect time to take a break at Windmill Lodges, with flowers and blossom appearing and the promise of warmer weather, a relaxing Easter break in Suffolk will give you back the spring in your step. 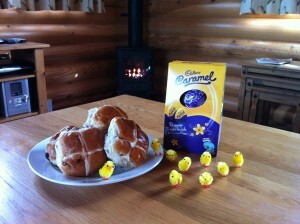 On arrival in your log cabin in addition to our usual welcome pack of wine, eggs, milk, tea, coffee and sugar, if staying over the Easter weekend you will receive an Easter Egg and Hot Cross Buns. What better way to start your holiday with a cup of tea and a toasted hot cross bun, or crack open the bottle of wine from your fridge and delve into the chocolate! During your stay with us there is lots to do irrespective of the weather and don’t forget the treat of your private hot tub beside your log cabin waiting for you after a day out. Join in the Easter Egg Hunt at Easton Farm Park, only 15 minutes drive from Windmill Lodges. Once you have finished your hunt you will find plenty to do for all ages from animals to meet and feed including spring lambs to pony rides, train rides and beautiful walks down to the river Deben. They also have a large indoor cafe and soft ball pit if the weather turns, so you can still enjoy a day out at the farm park whatever the weather. RSPB Minsmere has numerous activities throughout the year. 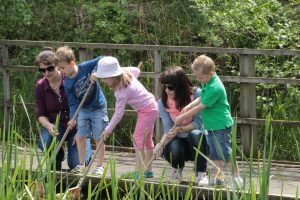 Events over Easter include pond dipping, discovering mini beasts, birdwatching and weekend walks. 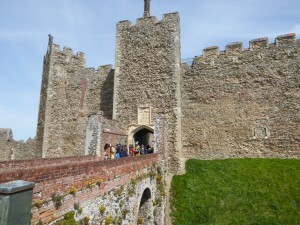 Only two miles from Windmill Lodges is Framlingham Castle. The castle holds Easter activities and this year you can join in their Easter Adventure Quest. Please click the link above to find out more Take a walk around the top of the castle wall to enjoy the spectacular view across Framingham Mere and the surrounding countryside. Suffolk Wildlife Trust have a number of events over the Easter period suitable for tiny tots upwards including Easter Egg Hunts at Foxburrow Farm or Carlton Marshes. Use the link above to search for the dates of your visit and see what takes your fancy. Don’t forget to visit our Spring at Windmill Lodges page with more ideas to help you make the most of your holiday at this lovely time of year. We have loved our stay here. The lodge was so cosy and the hot tub is amazing! The staff were so helpful too! We will definitely be back. Thank you! Lovely place for a quiet relaxing short break, not far from home. Wow! Wow! Wow! What a wonderful, relaxing and beautiful week we have had in your beautiful lodge. Boys loved the pool, we all loved the hot tub. Fell in love with the little duck family. Can't wait to come back again. Thank you - sad to leave. First visit to Suffolk. Loved the cabin, everything we needed and hot tub was fantastic. Lovely days out in Southwold, Walberswick and Framlingham. We'll be back! Awesome break, very relaxing. Aldeburgh was lovely, very fresh, great shops & beach. Hot tub fab again, cabin very clean and tidy. Can't wait to come back. Peaceful and relaxing location, welcoming and helpful staff. Excellent place to stay. We thoroughly enjoyed the hot tub. ©2013 Windmill Lodges, all rights reserved. Site by Mustard.